Every morning (EST) emails are sent to each Maximus user with information about how their campaigns have been performing over the last 7 days. The email is separated into different sections for a breif overview of campaign performances. The Weekly Numbers show the number Active Campaigns, Weekly Revenue, the number of New Campaigns, and the total Fire & Forget™ Updates over the last 7 days. The Top Performing Campaigns section displays the 3 most profitable campaigns over the last week, including the profit and number of clicks the campaigns have received. 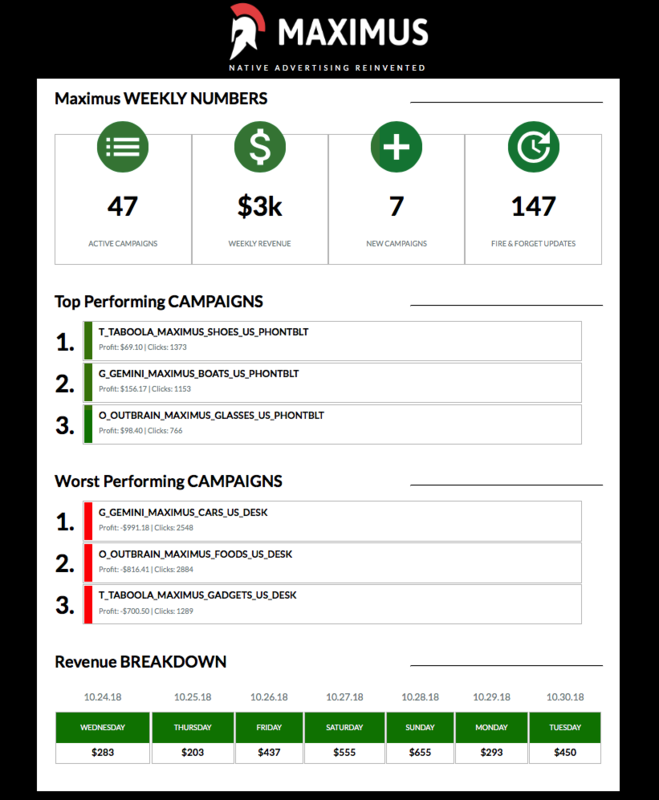 The Worst Performing Campaigns section displays the 3 campaigns which have lost the most over the last week, along with the profit loss and number of clicks those campaigns have received. The Revenue Breakdown section shows the total Revenue per day for the last week.